The ANSWER Coalition is circulating the following message from the Partnership for Civil Justice Fund. We are encouraging all our supporters to send a letter to New York's District Attorney calling for all charges to be dropped against Occupy protesters who were unjustly trapped and arrested on the Brooklyn Bridge. After sending your letter, please share this message with others through email and social media. Organizations and individuals in New York City and around the country are calling on the Manhattan District Attorney to drop the charges for the 700+ people who were illegally arrested on the Brooklyn Bridge on October 1. Please add your voice to this effort. Click here to send your letter - we have set up an easy-to-use system to dispatch your message, it will only take a minute. We have provided a sample letter, but feel free to modify the letter. 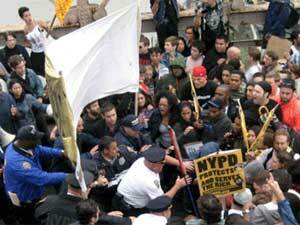 On October 1, 2011, more than 700 peaceful demonstrators were trapped and arrested on the Brooklyn Bridge by the NYPD. Police command staff and officers actually led and escorted the march out onto the Brooklyn Bridge and then, when they reached the middle of the bridge, did an about face, stopped the march, trapped people, refused to let them go, and arrested them, all without probable cause. Now those arrested are being forced to return to court to face baseless charges. These are working people, students, people looking for jobs, who must face the hardship of being prosecuted, and who did nothing wrong. Click here to add your voice today and ask that the charges be dismissed. The demonstrators were subjected to a mass sweep trap-and-arrest tactic used by the NYPD that is unlawful and unconstitutional in its entirety. The Partnership for Civil Justice Fund is releasing the letter that we sent to the District Attorney yesterday. Click here to read the letter from the PCJF to the NY District Attorney. Help protect free speech now! Send your letter to District Attorney Cyrus R. Vance, Jr. today.